One of the things that I pride myself on with OnPoint is that I’ve really spent some time thinking through all of the diagnostic tools that might be beneficial to our clients to help us problem solve an issue quickly and with certainty. 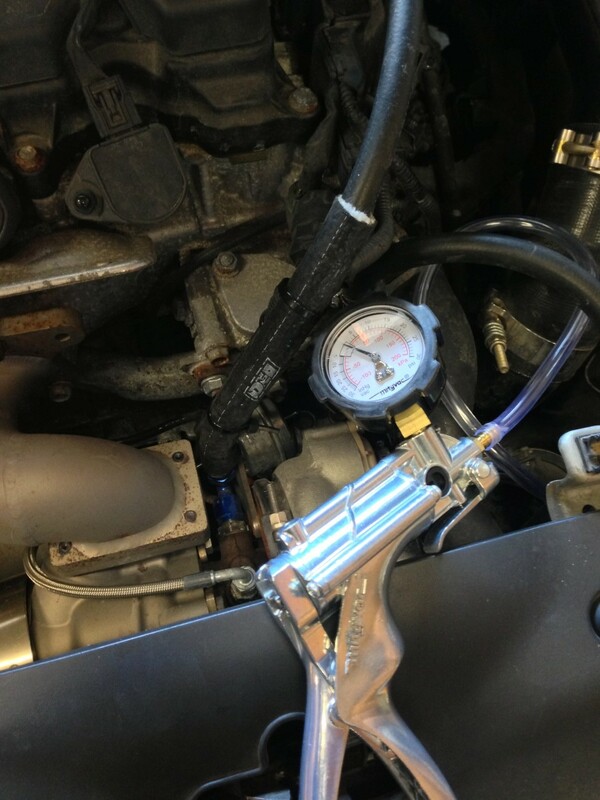 Finding and fixing problems quickly on the dyno will save our customers a ton of money. There’s nothing worse than tuning a car with a mechanical problem that once resolved requires another tuning session! On Friday I had the pleasure of street tuning Ed’s civic – this is one of the first Borg Warner EFR’s in existence and is a very rare kit from Full-Race. The turbo is so small and so responsive that there was virtually no lag – above 2000 rpm boost was basically linear to throttle position. Unfortunately as soon as Ed started rolling into the throttle the car was building a great deal of boost, eventually we touched the boost cut limiter at 10psi. This kit is designed for 8psi. Well, one of the tools I purchased was a vacuum/pressure pump. Simply (it wasn’t simple, the turbo is burried under and intake, charge pipe and rad hose!) remove the hose off of the actuator and apply some pressure. We found the actuator was not cracking until 16psi, indicating excessive preload on the actuator. This is great for response – but causes huge boost spikes and unstable boost. 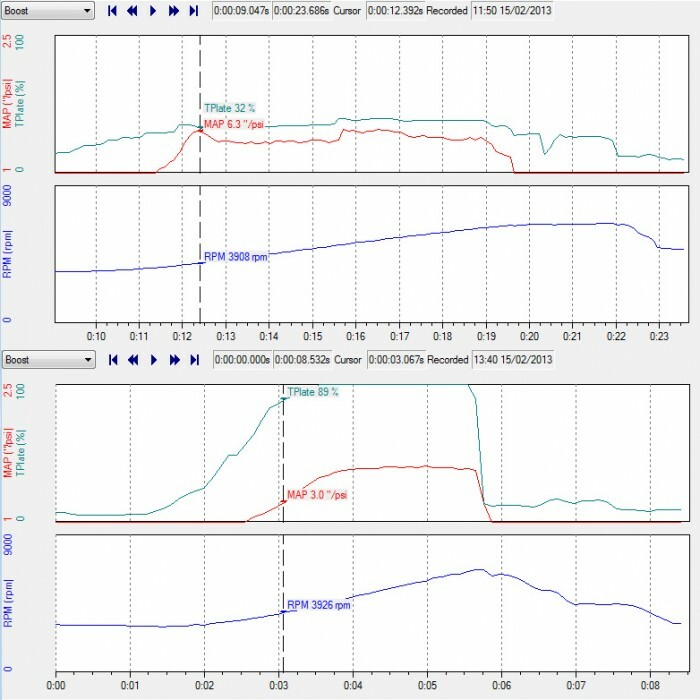 We lowered the preload until the wastegate started to crack at 9psi, and was fully open by 11 (or so – going by memory here). Once you add exhaust backpressure into the equation, the wastegate should now have no problem controlling 8psi boost. And just like that the problem was solved. No guessing at how many turns to go on the wastegate adjustment, we knew that we would be safe with the adjustment, and Ed is able to drive his car around without worry as he wanted. Once on the dyno we can add a little bit more preload back to increase turbo response, but with a front wheel drive car I really don’t think you want overly snappy boost response. Torque steer and tire spin are all that will result! Above is the original – where you see that 30% throttle was spooling the turbo aggressively and even at 6.3 psi it showed no signs of tapering off. The below graph shows how the car is now. Fairly lazy boost response, but smooth and fun to drive. A little bit more preload will be perfect.